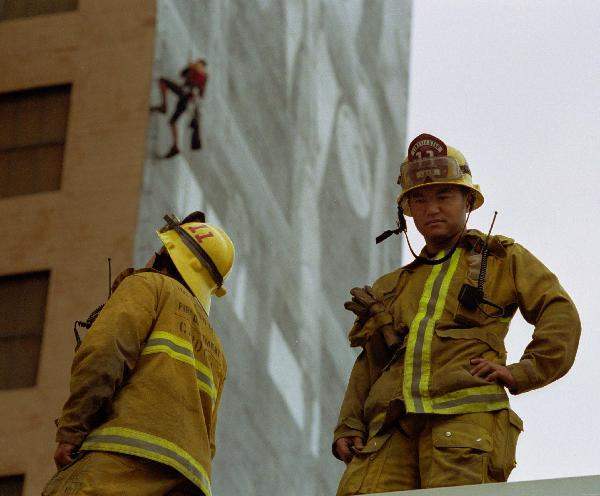 Firefighters standbye as a climber works on a banner hang in the back ground, at a local hotel in downtown L.A. this past Monday. The action, and following related photos, were concerning corporate control of our elected officials. The banner, once dropped, had many corporate logos on an American Flag reading "Sold." More information can be found on the websight www.soldoutusa.com.